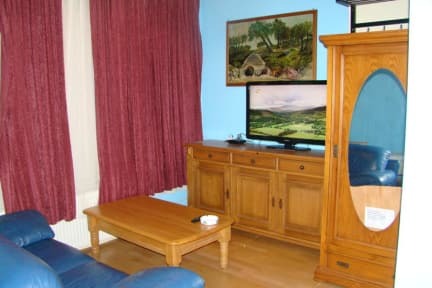 Amsterhouse B&B i Amsterdam, Nederland: Bestill nå! Amsterhouse B&B offers simply-furnished accommodation with free Wi-Fi in the centre of Amsterdam across the road of the red light district. We have 2 bedrooms for 4 guests each, containing 1 double bed and 2 single bed in each room. The communal living room includes fully equipped kitchen as oven, microwave, dishwasher, washing machine, dining table, refrigerator, coffee making facilities and sofa. At request can be assigned a private bathroom. We are not a luxury accommodation but a modest, just at city centre. Amsterdam Central Railway Station is only 250 metres from Amsterhouse B&B and offers metro, tram and train connections all over the city and beyond. Chinatown and the Red Light district are only a 5-minute walk away. Discos are at walking distance. Check in from 14:00 to 24:00 . Late check in after 24:00 Eur 25.00 charge.